Martin McGuinness’s career to date has seen some surprising twists. WITH THE RESIGNATION of Sinn Féin’s Martin McGuinness as Deputy First Minister, Northern Ireland is being fast-tracked to a new round of elections. McGuinness stepped down from his role amid the ongoing ‘cash for ash’ scandal, which involves his colleague, First Minister Arlene Foster. Explainer: What is the ‘cash for ash’ scandal? This latest step marks yet another twist in McGuinness’s career: A man who acknowledges he was once a member of the IRA but ended up occupying one of the highest offices in the North when he became its Deputy First Minister. Now he’s stepping down and leaving Stormont without one of its most experienced politicians. Foster had been under major pressure to step down due to the scandal, which was sparked by allegations from a whistleblower that the Renewable Heat Incentive scheme was being abused. An investigation has been launched into the situation, which could cost taxpayers in Northern Ireland upwards of £400m. 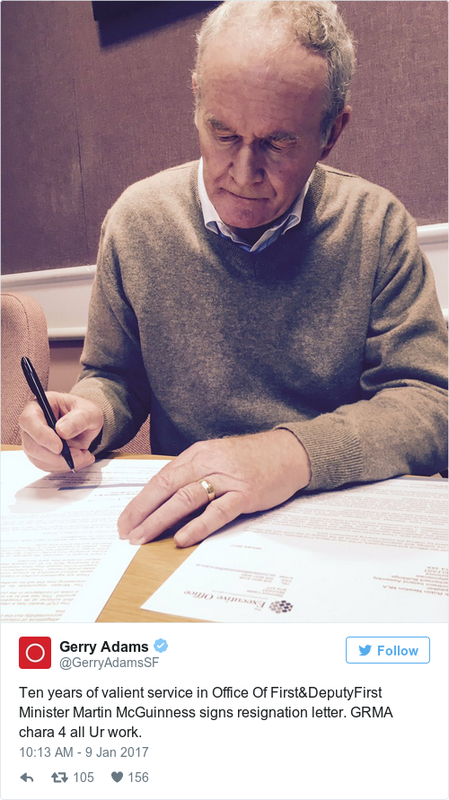 Foster faced a vote of no confidence in the assembly in December – but survived. Though the news of McGuinness’s resignation was in some ways unprecedented, on Saturday, Sinn Féin president Gerry Adams – at whose side McGuinness has long worked – had warned that the Stormont assembly would collapse if Foster did not step aside. But McGuinness has pledged that his resignation won’t mean change in the power-sharing situation, telling journalists there will not be a return “to the status quo”. Still, Sinn Féin has decided not to nominate a successor to McGuinness until after an election – and unless it appoints a successor, that election will be triggered in seven days. Born in 1950 in Derry, McGuinness was second-in-command of the IRA in his home city by the age of 21. He says that he left the IRA two years later, in 1974. In 1973, he was jailed after being arrested near a car that contained explosives and ammunition. After his release he became more involved with Sinn Féin. By 1982 he was elected to the latest attempt to set up a devolved Northern Ireland assembly – but as an abstentionist he did not take his seat in Stormont. McGuinness played a key role in the Northern Ireland peace process, taking on the job of chief negotiator for Sinn Féin in the talks that led to the Good Friday Agreement and a new era for the north. When the peace process eventually led to the setting up of a power-sharing executive, he first took the role of Minister for Education, later ascending to become Deputy First Minister in 2007 – with the DUP’s Ian Paisley taking on the First Minister role . This came after the St Andrews Agreement, which finally brought devolution of power to Northern Ireland and saw longtime foes the DUP agreeing to share power with Sinn Féin. In 2011, he ran in the Irish Presidential election – despite the fact he was unable to vote in it himself. He was challenged on his IRA past while running in the election. In the last two decades we’ve seen the most remarkable happenings in McGuinness’s career. The first, the revelation that he and DUP leader and First Minister Ian Paisley had more than just a civil working relationship – and were on friendly terms. His relationship with Paisley’s successor Peter Robinson – who retired in January of last year, and was replaced by Foster – was decidedly more businesslike. “I have a working relationship with Peter,” McGuinness told The Nolan Show in 2014. I mean, I’m in a position of Deputy First Minister for seven years now, and it all started with the relationship with Ian Paisley and to the surprise of many people, Ian Paisley and I had not just a good working relationship but a good personal relationship, which has existed to this very day. McGuinness said in the same interview that he was told one of the reasons Paisley had to go was his close relationship with the Sinn Féin member. “I think that an essential phase of the whole process of conflict resolution is the importance of reconciliation between political opponents and between everybody in the community,” said McGuinness. Alongside his relationship with Paisley, many commentators were also surprised by his decision to meet with Queen Elizabeth. The pair first met briefly in Belfast in 2012, where they shook hands. 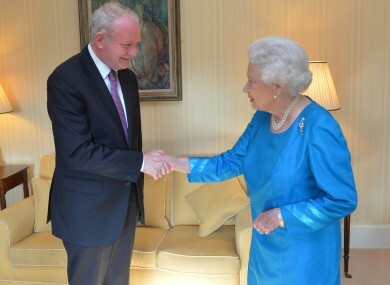 In 2014, McGuinness had a historic private meeting with her, which he described as “very nice”. I have many reasons why I shouldn’t meet with Queen Elizabeth, but she too has many reasons why she shouldn’t meet with me. But we both thought it was an important thing to do. The Queen herself even quipped “well, I’m still alive anyway” after being asked how her visit to Belfast in 2016 was going. This friendliness to the head of the British monarchy was a sign of how things had changed regarding Sinn Féin’s approach to the royal family. But it didn’t come without much work behind the scenes. McGuinness said that his party “obviously wasn’t ready” during the Queen’s previous visits, telling Paxman “we have conducted enormous conversations and discussion with our own people particularly in advance of Queen Elizabeth’s visit to Belfast” and on whether or not he should be meeting her. “Effectively people realised in the context of the conflict resolution process that it was very important to be involved not in mealy-mouthed words of reconciliation but actual acts of reconciliation,” he said. “Similarly, I never would have imagined I would have been Minister for Education in a power-sharing government in the North,”, and neither could he have imagined being joint First Minister with Ian Paisley. And I’m an Irish republican and absolutely dedicated to ending partition and bringing about the unity of the people of the north and the north with the south and we’ve agreed in the context of the Good Friday Agreement that that can only change through a constitutional vote and I am working to achieve that. I do believe that we are inexorably moving towards the reunification of Ireland but it can only happen by purely peaceful and democratic means. In his resignation letter yesterday, McGuinness said that his 10 years in the role were “difficult and testing”, but that he had “sought with all my energy and determination to serve all the people of the north and the island of Ireland by making the power-sharing government work”. He has, he said, “sought to exercise my responsibilities in good faith and to seek resolutions rather than recrimination”, and accused the DUP of never “fully” embracing the “equality, mutual respect and all-Ireland approaches enshrined in the Good Friday Agreement”. He described the DUP’s handling of the ‘cash for ash’ issue as “completely out of step with the public mood”, saying that the fact Foster has not decided to stand aside means her position is “not credible or tenable”. McGuinness has had to pull out of recent engagements for health reasons, but he said yesterday that his health was not part of his decision to resign. “Health has got absolutely nothing to do with it whatsoever,” McGuinness told journalists. Whether health concerns do go on to determine how his career progresses, a look back at McGuinness’s years in politics so far is a look at how much those in power in Northern Ireland have changed. For a former IRA member to shake hands with the Queen, and have a good personal relationship with the leader of the DUP, was unprecedented back in the 1970s. But for Nothern Ireland to progress, and for change to occur, uncomfortable compromise has been needed at all levels. For Sinn Féin to occupy the place it does in the power-sharing executive, those in the party have had to take public steps that they previously would not have countenanced. But McGuinness’s resignation does also show that the stability of power sharing can never be taken for granted. He and Foster do not have the relationship he and Paisley had – and neither the DUP or Sinn Féin are looking like they will back down given their takes on the ‘cash for ash’ scandal. “We now need an election to allow the people to make their own judgement on these issues democratically at the ballot box,” concluded McGuinness. What happens next will most likely be up to the people to decide, as they gear up for a possible election. Email “McGuinness resignation: The latest chapter in a remarkable political career ”. Feedback on “McGuinness resignation: The latest chapter in a remarkable political career ”.